I get e-mails periodically asking where the heck I've disappeared to, why I'm not blogging, and of course more questions than I can answer about old recipes from the blog. Other than occasionally posting something to my Facebook page, I know I've seriously missing in action for some time. Almost 2.5 years, actually, which is aeons in internet terms. During that time, I've been amazed to see that people continue to find my blog in impressive numbers and I've continued to get many e-mails. But my life has changed, and so has the blog world, and it's been hard to figure out whether to start blogging again and if so, what to blog. Indulge me in a little "blogsplaining." A miraculous and insane thing happened that transformed my life and rocked my world in a way I never could have imagined. About 2.5 months after my last post my partner and I got a call that forever changed our lives. I had just wrapped up my second-to-last year of school for nutrition and food science and thought I was going on to work full-time in my field. The call was to ask us to become foster parents to two boys, ages 1 and 9. We said YES, and never looked back. We are still parenting these wonderful boys and have changed so much as people because of it. But it sure did turn our lives upside down. My plans to go to grad school were put on hold. My ability to work was greatly reduced when both boys ended up having special needs that required lots of time, special care, and appointments. My whole life revolved around learning how to be a first-time parent, not to a single infant like most people experience when they become first-time parents, but to two kids with a lot of needs and a lot of life experiences prior to joining our family. Only recently have I felt like I've gotten into the groove of life enough that I can look outside the walls of my house and start to tentatively pursue my own interests, career, social life and other things besides parenting again. This is not going to become a blog about parenting or foster care or adoption. I'm not even sure that I'll blog regularly again. I've continued to cook some fabulous, healthy, kosher, gluten-free meals for my family, but I have much less time and energy to worry about presentation and am usually tired and just wanting to get dinner on the table. But I did want to share my adapted, fresh herb-laden version of a really fantastic tomato sauce recipe I found on Dog Island Farm's website. And who knows? Perhaps I'll share another recipe again soon. I whipped this up yesterday when I saw that the 4 lbs of organic tomatoes from the CSA share were starting to get a little ripe, I had some bruised basil I was about to toss, and our oregano plant was starting to bolt. It was so insanely good that I considered ladling it into bowls and serving it as "tomato soup." No one would have been the wiser - With the herbaceous and garlicky flavor and subtle sweetness, it is absolutely flavorful enough to eat by the spoonful. Last night I used some of the leftover pan juices to flavor some greens that I braised with chickpeas and served over brown rice for a simple vegetarian shabbos meal. A big thanks to Dog Island Farm in Vallejo, CA, for inspiring me to get back on the food blogging horse. Check them out on ye olde Facebook, and peruse their site for some incredible recipes using fresh produce. *I threw in about 1/4 lb of whole Sungold cherry tomatoes from a friend's garden, too - This recipe is flexible enough that measurements need not be exact.You can use whatever tomatoes you have on hand, even ones that are bruised or slightly overripe. As the original recipe points out, meatier tomatoes with less water content are ideal. Preheat oven to 350F. Scoop our the tomato "guts" (the slimy contents of the tomato that contain the seeds). Toss tomatoes, onions, garlic, pepper, salt, herbs and olive oil in a large non-aluminum roasting pan. Turn each tomato cut-side up. Bake for 1.25-1.5 hours. If the bottom of the pan still has a ton of thin juices, you can turn the oven up to 450 F (or even to broil) for a little while to try to reduce the juices, or just reserve half the juices when you transfer into a bowl or pot for pureeing to avoid a watery sauce. In the pot or bowl, add sugar, red wine, and garlic powder (if desired). Using an immersion blender, puree the sauce to desired consistency. I prefer it pureed fairly thoroughly. Adjust salt and pepper to taste. You can add more of the reserved pan juices at this point if it would benefit the texture. Serve in your favorite Italian recipe, use as a base for a fantastic tomato soup, or freeze for future use. This recipe is part of Weekend Herb Blogging, being hosted this week by Cooking with Siri. This is a continuation of Gluten-Free Products for Passover: Part 1. 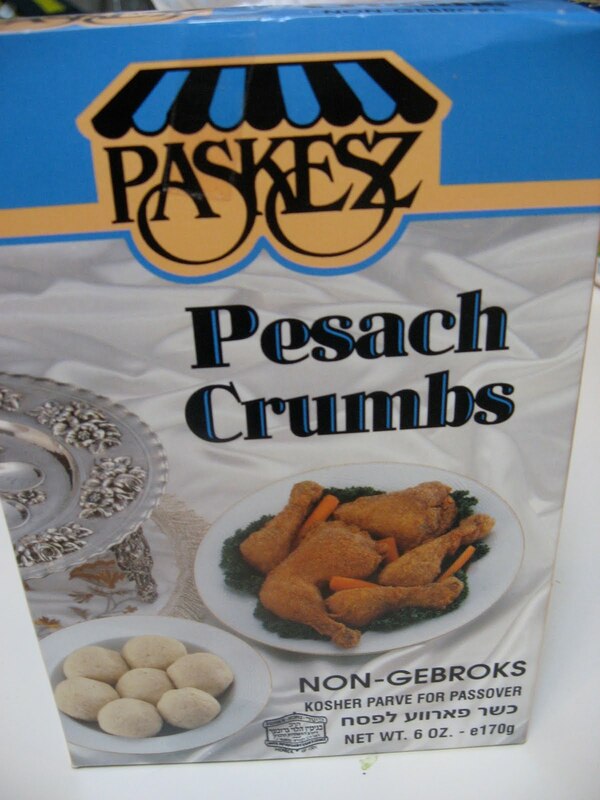 Paskesz's Pesach Crumbs are "bread" crumbs made of nothing but potato starch, eggs and shortening. You can use them to bread chicken cutlets for baking or frying, which is what I plan to do with them. 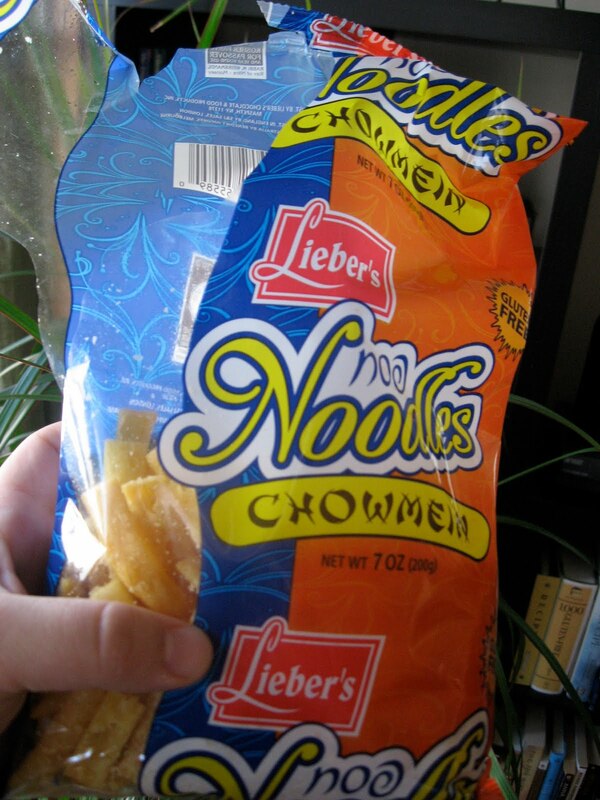 I'm sure they'd be great on fish, or as a filler for meatballs, too. Sandwich cookies filled with apricot jam... Unfortunately I didn't realize they were sugar-free until I got them home. Oh, well! Hopefully they'll still be good. Oberlanders makes gluten-free ladyfingers I've enjoyed in the past. Zemer's finger cookies with raspberry jam inside, dipped in chocolate. 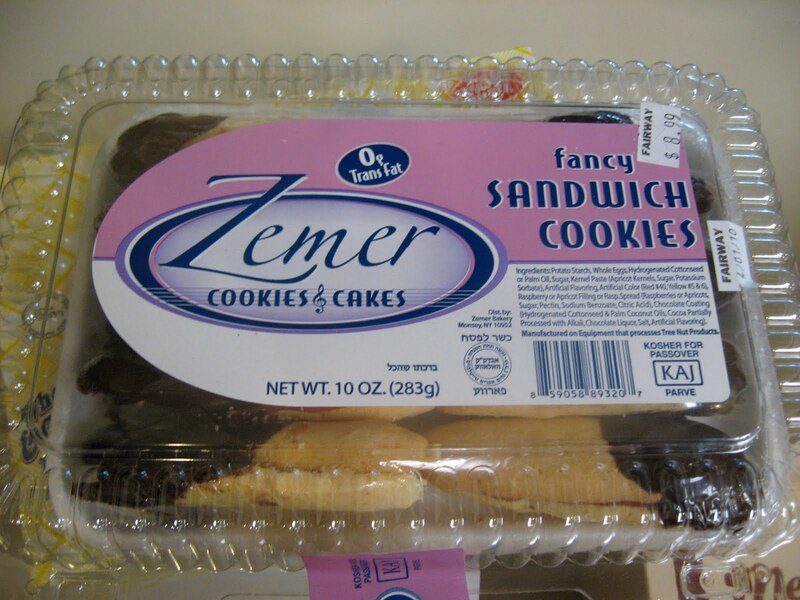 I grew up eating (non-Pesach) cookies like this so they make me happy. 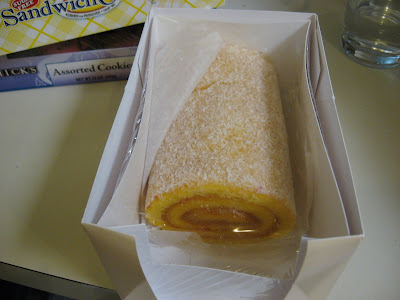 Schick's makes some of the best Pesach baked goods. They use not just potato starch but also almond meal and almond paste in some of their items. These cookies are an assortment, and I've had them before and enjoyed every bite. I especially like the jam-filled sandwich cookies. And no, I won't be eating these baked goods all myself (though I could). Several are to take to our seder hosts, for unlike last year we're not hosting our own seders this year... Although I love cooking for other people, various stresses right now make the thought of having seders at other peoples' houses a huge relief indeed. Other items I bought included cake mixes (Leiber's is good, but I wasn't impressed by the Haddar brand), hot dogs, and my childhood favorite... raspberry jelly rings! 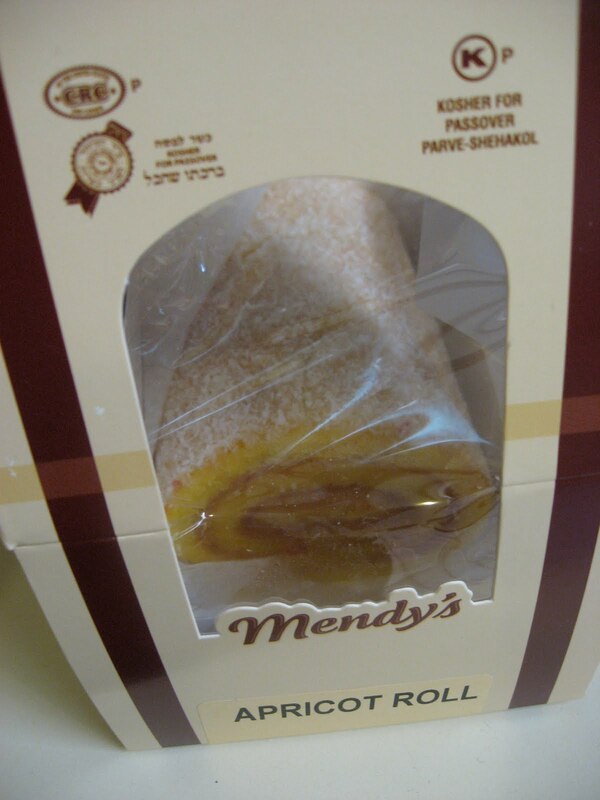 Keep a few things in mind when you buy gluten-free Passover goods. First of all, non-gebrokts does mean no gluten or grain ingredients, but it does not mean that there was no cross-contamination or that the equipment was cleaned thoroughly. So it's best to check with each company unless there is a clear statement on the packaging. 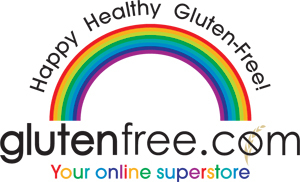 Also, be careful because many of the products I listed in my posts can also be found in non-gluten-free versions containing matzo meal (blintzes, for example). 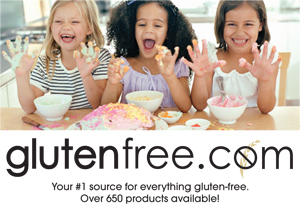 More about non-gebrokts and why Passover is a "gluten-free goldmine" can be found in a guest post from a few years ago here, which is still quite relevant. See more gluten-free Passover recipes and product information here. I am in that part of the semester where midterms commingle with final projects and papers until the whole last month of school feels like one long midterm. In the midst of it all comes Pesach (Passover)! And as many of you have noticed, and e-mailed me about, I haven't posted new Pesach recipes or matzo information yet this year. Some Jews finished their Passover meal planning a month or more ago (if you fall into this category, I envy your motivation & organization) and have already done all their shopping. Some Jews will be at the store Monday afternoon buying their groceries (I'm downright motivated compared to you all, as I got my shopping done today!. And for the non-Jews? Well, you lucky ducks have the whole 8 days and beyond as an opportunity to buy lots of gluten-free products not available the rest of the year, but without the stress of having to plan seders! I like Lakewood's matzo more than the other brand available (see brand and ordering info here) and it's cheaper, but because I find that gluten-free oat matzo tastes pretty close to cardboard, I only eat as much as is halachically required (required according to Jewish law)... the rest of the matzo I turn into tasty matzo pizza in the oven. 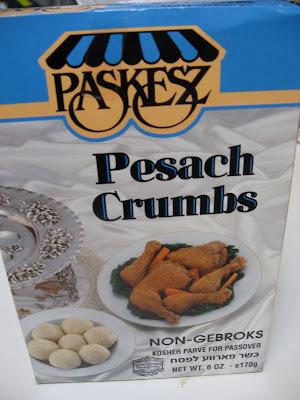 As for other gluten-free Pesach goods, most years I avoid them because they tend to be loaded with trans fats, preservatives, artificial flavors, etc. But this year I am on a very restrictive diet - for medical reasons I must avoid not just gluten but any high-fiber foods. For this reason I have a heter (permission) to eat kitniyos. I don't normally get permission to eat kitniyos because being gluten-free isn't all that restrictive on Passover... but trying to avoid most vegetables and fruits certainly is! In addition, the highly processed, potato-starch- or tapioca-starch-based Passover products are actually great for me this year because they're mostly very low-fiber. So I spent a lot of money on foods I would normally never eat. Here is a sampling of what I found at my local ShopRite (Paramus, NJ), Fairway (also Paramus, NJ) and Glatt Express (Teaneck, NJ.) Keep in mind a lot of these foods will be available until the 8-day festival of Passover is over, and some stores will even put them on sale afterwards. That's right, that's gluten-free chow mein noodles... Those thick, crispy, fried noodles that are served as an appetizer at Chinese restaurants! They aren't quite as tasty as the gluten-y kind, but they're still nice and crispy, salty and greasy... and taste great dipped in duck sauce. Apparently I liked them enough that I couldn't wait until I took a photo to open them. This year is the first year they're being sold, and they're being manufactured by several brands including Paskesz and Leiber's. That's Pao de Quiejo (Brazilian tapioca-cheese bread), now kosher for Passover! 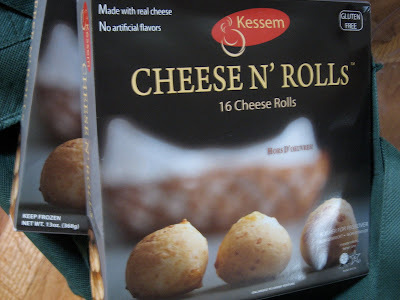 There's no consumer brand of kosher l'pesach tapioca starch but there is a commercial version that more and more manufacturers are using, which is opening doors to awesome products like this one, which allow us to eat cheesy bread-y rolls during the holiday. They are gluten-free and I bought a few packages so I can enjoy them during the year. Hoo Lachmu flats are expensive, and not the most tastiest things ever - They taste pretty potato-y to me. They are chewy, and not particularly bready. But they serve as a flatbread surface that you can top with tuna salad, or butter and jelly, or even turn into french toast (supposedly). So I bought a box. Kosher gluten-free chicken nuggets? Yes please! Were they madly expensive? Yes. Do I think they'll be worth it? Absolutely. I get to relive my memories of my treyf (non-kosher) and pre-gluten-sensitivity days when chicken nuggets at Burger King were one of my favorite treats. I doubt they'll be as good, but with enough BBQ sauce they can't be too terrible. Clockwise from upper left, that's another brand of Chow Mein noodles, Gefen's Cinnamon Cookies (which I really like, especially dipped in milk), two types of blintzes (make sure you look for ones that say "non-gebrokts" as that means they don't contain matzo meal), and three types of Osem cakes that are shelf-stable and will stay good for a long time in the cupboard. Blintzes are one of my favorite things to stock up on at Pesach because they're so good cooked in butter on the stovetop. I prefer the cheese ones, which I eat with fresh strawberries or a spoonful of good jam. Gosh, there are more products and photos than I can fit in one post. Click here for Part II! 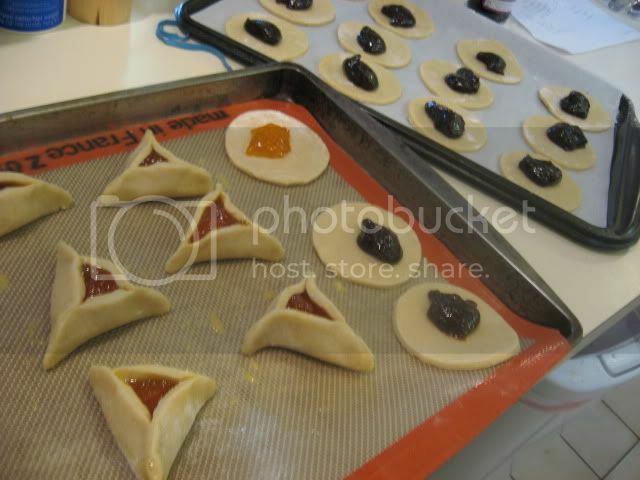 Purim just isn't complete without the delicious triangular purim cookies we call hamantaschen. 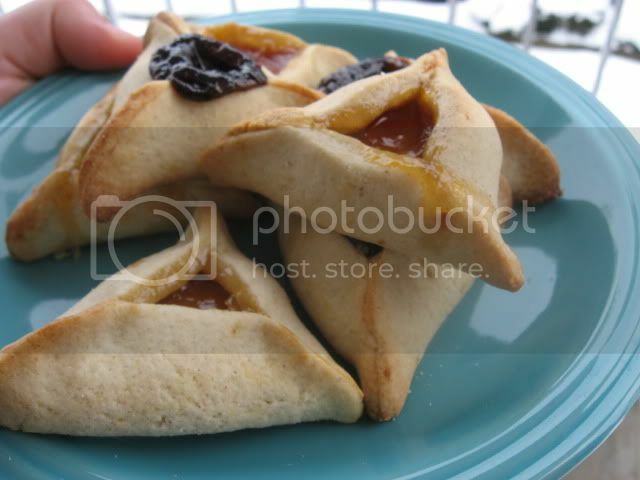 I love my original gluten-free hamantaschen recipe, which is made with agave nectar instead of refined sugar, but it's a little too cakey for some people. Today I tried my hand at revising the recipe to make the cookie a bit more crisp, more like a sugar cookie in its consistency. Did it work? Well, these are certainly more crisp than the original recipe. They're still more cakey than the crisp style some people prefer, so I'll try again next year... but I think they're tasty and I hope you do, too. I used apricot jam in some and lekvar (a/k/a prune butter or prune pastry filling) in others. They use regular sugar. They're also nut-free, and if you want to make them dairy-free I am guessing they'd be quite fine with margarine instead of butter. One perk of this recipe is that the dough is very, very easy to handle. 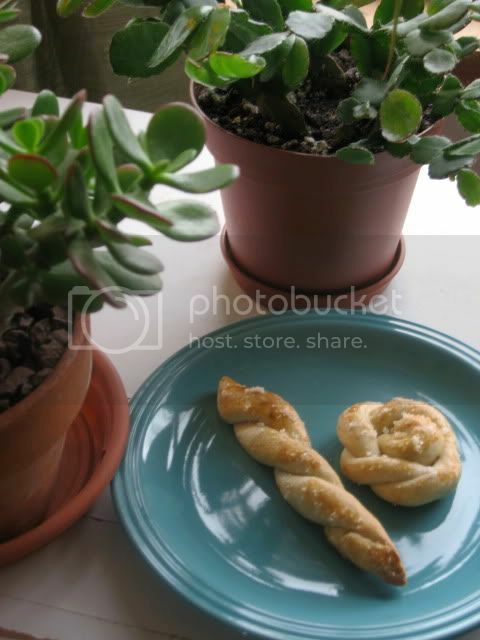 When I had a little dough left over, I twisted it up into various shapes which you can see in the photo below the recipe. With an electric hand mixer, or in the bowl of a standing mixer, cream the butter with the sugar. Add the unbeaten egg, lemon juice, lemon zest and vanilla and continue combining. In a separate bowl, combine all dry ingredients. Slowly add the dry mixture into the liquid mixture. Mix until combined into a cohesive ball of dough. Refrigerate for 2 hours or overnight. Preheat oven to 350 F. Line two cookie sheets with parchment paper. Flour a counter or other surface thoroughly. Remove dough from refrigerator and immediately roll into a ball and roll the ball in flour before placing it on the floured counter. Roll out until 1/4" to 1/8" thickness. Using a juice glass or biscuit cutter, cut into 3-4" circles. Immediately move dough circles to parchment-lined cookie sheets. Use a pastry scraper to gently transfer the disks of dough. Place approximately 1 teaspoon of filling (apricot preserves, lekvar, poppyseed filling, raspberry jam, etc) in the center of each circle. Using a pastry brush, apply well-beaten egg to the perimeter of each dough circle and immediately fold 3 sides of circle together so that the cookie becomes a triangle, and pinch corners to seal. Seal completely and firmly, using beaten egg so they do not come apart in baking. The final cookie should look like a triangle with the filling showing through only at the center. Use the remaining beaten egg to lightly brush the top of each pastry. Bake at 350 F for 22-28 minutes or until golden on top with some slightly browned areas (the more browned, the crisper the cookie - but be careful not to burn!) Allow to cool slightly before serving or transferring to cooling rack. I am in love with this new recipe I made on Friday night by combining and adapting two different recipes. It's terrific! So filling, too. 2) It tastes like it's made with heavy cream, even though there's no milk in it at all (the only dairy is cheese, and that's optional). It really tastes like there's massive amounts of milk and cheese, but there's not. 3) It is really good cold! I ate it for breakfast this morning and it was wonderful. 4) I realized while cooking and eating it that it could easily be made without the cheese and would be almost as good, so with a few changes (noted in the ingredient list) it could be a great dish for vegans, dairy-allergic folks and anyone who needs a pareve dish. 5) It doesn't need to be a side dish - It makes a great main dish, too! We had it as the main part of our meal. 6) Making the rice itself was quick. It took no more than 20 or 25 minutes. I had imagined it would take forever, but it didn't. 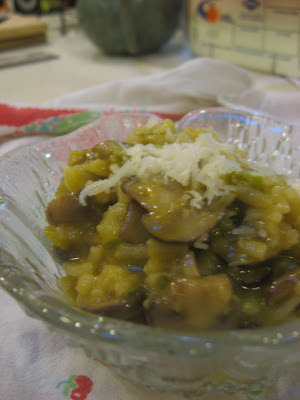 Some tips: I call for you to saute the mushrooms and leeks in a separate pan but if you want you can saute them in the pot you'll be making the risotto in, and just remove them and set them aside in a bowl while you saute the onion and make the rice. This will save you a dirty pot, but it'll create a dirty bowl... Your choice! Use the most flavorful vegetable stock you can get your hands on. I used Imagine Foods Vegetable Cooking Stock because it's richer than the regular boxed vegetable stock. You could also use homemade vegetable stock (if you don't have your own recipe, try my VictoriousVegetable Stock). For white wine, I used Kedem White Cooking Wine since it's so much cheaper than buying a bottle of real white wine. But skip that shaker of dried-up parmesan cheese! Stick to the real shredded stuff, or just do without. In a saute pan, melt butter (or margarine if you want it to be dairy-free) over medium heat. Add leeks, and saute until they begin to become tender. Add mushrooms. Continue to sautee until both mushrooms and leeks are tender and leeks begin to brown just slightly. Remove from heat and set aside. In a small pot or saucepan, combine vegetable stock, water and white wine and cook until they simmer. Cover and keep over low heat so the mixture stays hot. In a medium pot, heat the olive oil over medium heat. Add the onion and garlic and saute until soft. Add salt and fresh ground black pepper. Stir in the arborio rice and cook for 1-2 minutes, stirring to make sure the rice becomes coated in the oil. Stir in the rice and cook 1 minute, coating rice with the oil. Add one cup of the hot stock-wine-water mixture and allow to simmer until the liquid is mostly absorbed (there will still be some visible but when you stir it you should see that it's very thick and most has been absorbed by the rice). Stir very frequently to avoid sticking. Add the rest of the liquid, a cup at a time, waiting each time until the liquid is absorbed by the rice. Taste regularly to gauge doneness, as the risotto should have a creamy consistency but each grain of rice should remain a bit chewy at the center. The rice grains should not themselves be mushy. If the last of the liquid's been absorbed and the rice is still undercooked you may add additional hot water, stock or wine. Stir in the cheese and the mushroom-leek mixture, and adjust salt and pepper to taste. Serve immediately, garnished with additional shredded cheese if desired. Here I am to apologize for yet another long absence from blogging, dear loyal readers. Being a full-time dietetics student is taking a lot out of me, combined with chronic health issues that have been wearing me down. I miss blogging regularly, I really do. I miss having a real back-and-forth with my readers and the excitement of trying and posting new recipes and photos all the time. Fortunately, I'm finally starting to feel way better. It's also autumn, which always makes me want to cook and bake. I made an amibitious and wonderful feast for Shabbos last week. I was recovering from a root canal (what fun) so I focused on soft, easy-to-chew foods. We had butter beans sauteed with fresh rosemary, white wine, red pepper flakes and onions (a perennial favorite of ours)... mashed potatoes... spinach sauteed with lemon zest and garlic... and though I rarely make dessert, I actually made two! We had baked apples... and a crumb cake made from Gluten-Free Pantry's Coffee Cake Mix, which was out of this world! But the highlight of the meal wasn't the decadent dessert, it was the homeade Creamy Butternut Squash & Parsnip Soup. We are both big fans of Pacific Natural Foods' Organic Creamy Butternut Squash Soup and Imagine Foods' Organic Creamy Butternut Squash Soup, which are both kosher (pareve), vegan and gluten-free. We always keep a few containers in the house and eat this otherwise dairy-free soup with a little low-fat sour cream (or my vegan cashew sour cream) and some spicy toasted pumpkin seeds on top - I find it's a healthy and easy way to make a salad or other light fare into a real meal. Soup is also great to fill up on when you're watching your caloric intake, as it's very filling. It is often low in calories, especially if you avoid cream-based or meat-based soups. I decided to try making butternut squash from scratch for the first time ever, this time around. I wanted to do something a little different, and at the market the parsnips looked fat and wonderful so I decided to give them a shot. 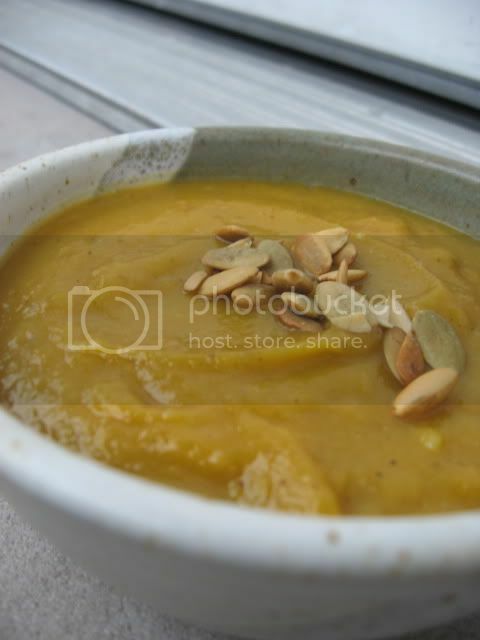 The soup turned out to be fantastic, with a perfect swirl of sweet and savory flavors, and I hope some of you will try it out and let me know if you agree. It's got a little kick to it, so reduce the cayenne if you're not into that. It would be perfect for Thanksgiving. It has a thick and creamy consistency but if you like yours a bit thinner, just add more broth, rice milk or water. I haven't frozen it yet but from my experience freezing soups, this one should freeze quite nicely. Though homemade is always the best, there are times when we can't cook soup from scratch. For those occasions, there happens to be a promotion right now where if you order Imagine Foods' Creamy Butternut Squash Soup through the link I provided you can save 15% if you enter the code HAINGF25 at checkout. [Plus, save an additional 15% when you combine the instant rebate with your Subscribe & Save order--bringing your total savings to 30%. Offer valid through October 31, 2009]. Cut cleaned, trimmed butternut squash into chunks or slices (about 1 1/2" in size, maximum). Slice peeled parsnips into 1/2" slices. Remove thyme leaves from woody stalks. Discard all but the leaves. Heat large soup pot over medium-high heat. Add olive oil. When the olive oil is hot, add onion and sautee until it begins to brown. Add garlic, squash, parsnip and thyme. Stir and sautee for 2-3 minutes. Add vegetable broth, ginger and all spices and herbs. Vegetables should be almost covered by vegetable broth, but it's fine if they're not completely covered. Bring to a boil, cover and cook on medium heat until the squash and parsnips are soft. Once the vegetables are soft, turn off heat, mix in rice milk, and allow to cool a bit (I transfered the soup to a bowl to allow it to cool more quickly). Once it's cool enough to blend safely, either use an immersion blender to puree or carefully blend in a regular blender. If you use a regular blender and the soup is still warm or hot, do not fill more than half way - Blend in batches, and as you blend each batch return it to the pot on the stove. You can reheat the soup over low or medium-low heat before serving, if necessary. Add more rice milk or vegetable broth if you prefer a thinner consistency. This soup reheats well after freezing or refrigeration. Using a double-boiler or a heat diffuser, or adding a little extra liquid, will help avoid scorching when you reheat. Serve plain or garnish with sour cream, vegan sour cream substitute and/or toasted pumpkin seeds. I just posted one of my partner Rochel's recipes and I thought I'd share another. I feel silly posting this as a recipe because it is is less of a recipe than a list of ingredients, but it's so addictively tasty that I wanted to share it with you all. We make this with inexpensive kosher goat cheese we buy a huge log of for around $4 at Costco. 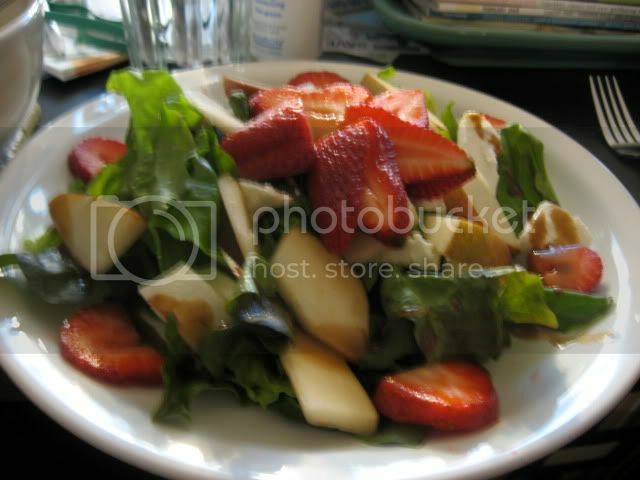 On each plate put a generous amount of romaine lettuce, then arrange strawberries, pear slices and slices of goat cheese in an attractive way. 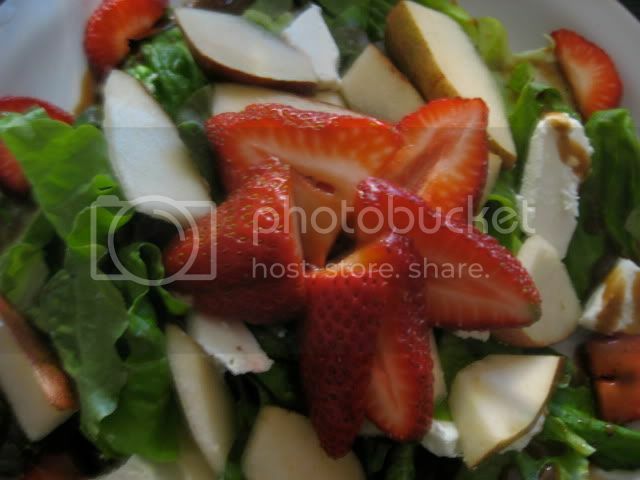 Sprinkle with pecans (optional) and drizzle with dressing right before serving.